Gorge Tour – Three hour tour includes a walk to the escarpment followed by a boat cruise through the gorge, or try SUPing through Cobbold Gorge. Scenic Helicopter Flights – 15 minute or 30 minute flights over Cobbold Gorge and Newcastle Ranges. A special extravaganza of highlights from towering sandstone arches, Adullams shelter, stone yard, agate fossicking, a visit to the grave of pioneer John Corbett and a boat cruise through the magnificent Cobbold Gorge. This tour has it all. This tour requires a moderate level of fitness as includes lots of walking on un-level ground. Camera with plenty of available memory – you’ll need it! Access to Cobbold Gorge is by guided tour only. Please contact them to make a booking. 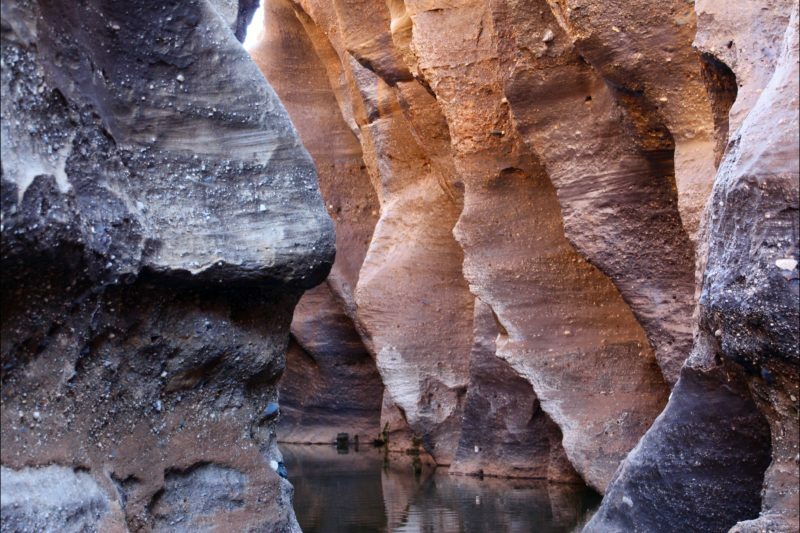 There’s no better way to grasp the uniqueness of the narrow gorge with its majestic, 30-foot sheer walls than to get up-close-and-personal with it. 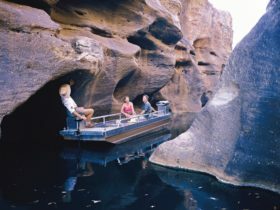 A three hour boat cruise and tour of the gorge will be an unforgettable highlight of your trip to outback Queensland, Cape York or Savannah Way. An informative insight to the geology of the rugged sandstone formations is provided during a guided bushwalk to the to the top of the escarpment learning about the fauna, flora and bush tucker along the way. It’s a relatively easy walk with the reward of a magnificent view of the gorge below. Then cruise on custom-made, electric powered boats as they glide through the spectacularly sculpted gorge walls in almost eerie silence ensuring minimal disturbance to wildlife. There’s every chance of seeing one of the large population of resident freshwater crocodiles. Walking in the footsteps of their cattle pioneers. This tour is for group bookings only. Ever wondered about life on working cattle station? There is no better opportunity to get a taste of outback Queensland than an insider’s view of Robin Hood Station in the heart of the Gulf Savannah. Robin Hood Station- supposedly named because it adjoined the Sherwood mining lease – is a 1284 square kilometre cattle grazing property run by third generation cattleman, Simon Terry and his wife, Gaye. Visit the cattle yards, dams and outbuildings while your guide offers rare insights to the cattle grazing industry. You’ll see firsthand the implications of today’s management and future challenges for people who love their land and want to pass it onto the next generation of North Queensland cattlemen. Relax over a traditional, outback smoko before taking a relaxing cruise on the Kimberley Sue Dam. A helicopter flight offers visitors the ultimate flexibility in exploring and discovering the features of Cobbold Gorge which are not accessible to the public any other way. 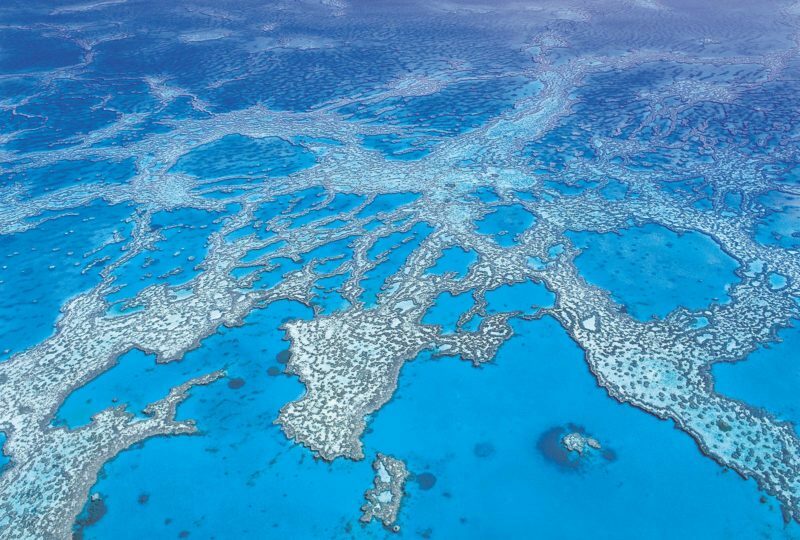 Standard options include 15 min Sandstone Discovery tour over Cobbold Gorge; 30 min Robin Hood Journey over the cattle station and sandstone area; 60 min Sunset Heli-Picnic; or 5-6 hr Great Northern Fishing adventure. Go gem fossicking at Agate Creek, explore the many hidden gorges or chasms or spirit away for a romantic picnic for two in the most stunning surrounds imaginable. Options for helicopter flights are limited only by your imagination and budget – you come up with the idea or destination and we’ll negotiate a price! Please contact Cobbold Gorge Tours as bookings for scenic helicopter tours are essential and subject to availability. Experience a breathtaking adventure of Paddle Boarding whilst silently gliding through the narrows of Cobbold Gorge. A one hour guided tour allows you to take in the wonders of this geological masterpiece of ancient landscapes. Suitable for all abilities and fitness levels. Participants must be at least 13 years.